The Save Our Kakaako Coalition held a "Mahalo Hoolaulea" at Kakaako Waterfront Park yesterday to celebrate saving the area from residential and commercial development. Here, members of the coalition gather to pose for a photo taken by photographer Chris McDonough. 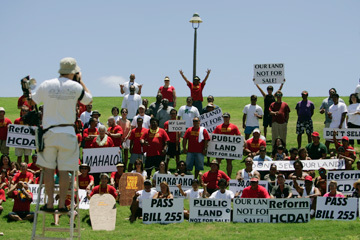 The community group lobbied for a bill that prohibits the Hawaii Community Development Authority from selling or approving for residential development waterfront land in Kakaako. 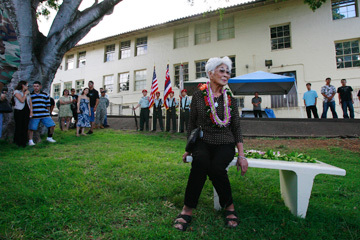 Haruko Akatsuka sat on a new bench Saturday at Roosevelt High School dedicated to her grandson Sgt. Deyson Cariaga. The bench and a jacaranda tree were installed to honor Cariaga, a 2002 Roosevelt graduate who was killed in action in Iraq on July 8, 2005, while serving with the Hawaii Army National Guard. Family, friends, comrades and distinguished guests attended the ceremony to honor Cariaga and his celebrate his 22nd birthday.